Hold the line and receive the M1922 MMG for the Support class and the Final Countdown headgear. Chapter 2: Lightning Strikes continues. Part of this latest Battlefield™ V Chapter is the second Chapter Event, called Hold the Line, which lets you fight, rank up, and be rewarded. Breakthrough takes center stage in the first Weekly Challenge. In this mode, the map is divided into several sectors, all owned by the defending team at the start of a match. If you’re on the attacking side, your goal is to take the sectors one by one in sequential order. This is done by controlling all available capture points, a.k.a. flags, in the sector. The defenders’ role is to hold the sectors by stopping attackers – who have a limited number of forces for each sector – from capturing the objectives. Let’s go through the Breakthrough-related tasks that stand between you and a stylish reward: the Final Countdown headgear. Breakthrough: Play three rounds of Breakthrough. Kicking off smoothly, your first task is to complete three matches of Breakthrough. Remember, Breakthrough is part of several Grand Operations but can also be played as a standalone – choose your approach in the multiplayer menus. Instead of just waiting for the end-of-round screen, seize this opportunity to master the mode! Make the way you stay until the end fun and enlightening; learn how coordinated attacks, map knowledge, and squad orders will help the attackers and witness how Fortifications and Supply Stations help defenders. Break the Objective: Capture ten objectives in Breakthrough. When you’ve found your feet in Breakthrough, you’ve probably captured an objective or two with the help of your team. If you choose Break the Objective in the first fork of the road, you can simply keep that up. Locate where your team is focusing its attacks, communicate with your squad on the next course of action, and remember that the more soldiers that occupy an objective, the faster it will be secured. However, if any enemy soldiers are also in the objective area, it will slow down or stop the capture process. Keep ‘em Up: Revive 20 teammates in Breakthrough. If you’re not up for Break the Objective, you can choose a task that will be just as helpful to your team: reviving. Any class can revive (if it's a squad mate), but Medics do it faster – and can revive any team member. Look for revive icons on the battlefield for resuscitating opportunities. However, pause and think for a second if you see a ton of those icons in the same spot – that spells trouble, especially in a mode like Breakthrough with its obvious meat grinder choke points. Not only will reviving buddies help you clear this task, you’ll get extra XP and good karma thanks to the way that you’ve been treating your friends. Breakthrough Champ: Win five rounds of Breakthrough. There’s a third route to take after the first task has been completed – a potential shortcut to the final goal. Win five Breakthrough matches to get access to the last challenge right away. Winning comes down to consistent, focused team play. As the attacking team, capturing all objectives through to the final sector will win the round. In one of our Battlefield V Dev Talks videos, you’ll see DICE developers play and discuss Breakthrough strategies. Around the 13:00 mark, they highlight the importance of ticket count awareness and pushing towards the final objective to avoid running out of forces. To win a round as defenders, try to make the enemy spend as many resources as possible taking the points. Bleed them dry and contest flags as much as possible to cause delays. True Blitz: Capture an objective within two minutes after spawning in Breakthrough. Time to show everyone the meaning of efficient warfare. When you’ve completed Break the Objective, you can try this speed challenge. Jump into the action, preferably by spawning on a squad member who’s about to capture an enemy flag, and get to it. As mentioned, you can save time in your flag capturing if you have a lot of teammates doing it simultaneously. If your squad isn’t always on time, don’t despair – keep attacking with coordinated efforts and you’ll clear this one. Take it Back: Re-capture five objectives as defender in Breakthrough. If an objective has been captured by the enemy but the sector is not yet lost, defenders may re-capture the objective from the enemy team. Enemies are sure to be frustrated by the way that you come back to objectives for a re-capture – which is always enjoyable! Raider: Win a round of Breakthrough as the attacker. Even if you're on the attacking side, there's much to be gained from defensive play. After you've captured a control point, don't always just sprint for the next. Set up shop; build Fortifications and guard the routes that enemies will come from. If flags aren't guarded, Breakthrough matches tend to "yo-yo" – with flags switching owners back and forth. Protector: Win a round of Breakthrough as the defender. In the aforementioned Battlefield V Dev Talks video, you’ll get many great tips for both defending and attacking in Breakthrough. One of these pointers is to create your own objectives, on top of those flashing on your mini-map. This could be anything: such as holding a specific street corner on the Rotterdam map, causing trouble for an enemy tank trying to attack your sector. Try to find your own mini objectives to support the main cause. Crucible: Kill 25 enemies in objective areas. You’ve reached the final task, and you can almost feel the reassuring weight of the Final Countdown headgear on your war-ridden noggin. Time to put a sizable dent in the enemy’s forces. For the final task, the tactics will differ slightly depending on whether you’re attacking or defending, but the main principle is the same: locate the action and be smart when approaching it. If you’re charging an enemy-held point, your foes will have their eyes on the most obvious points of entry. Flank them, use (or provide) tank support, or head for high ground with long-range weapons. You’re likely to score many of these 25 kills when fighting in points you own, too. If you’re holding a position on a close-quarter map like Rotterdam or Devastation, guard alleyways and choke points where the enemy is likely to enter and go for a quick kill – perhaps as an Assault player. If you’re playing on more open maps like Arras or Twisted Steel, your enemies might not get inside the objective area in time for you to kill them, but, on the other hand, you’ll see where they’re going earlier. Frontlines: Play a round of Frontlines. No pressure. Join a game of Frontlines – either as part of a Grand Operation or as a standalone mode – and complete it. Spend a few extra seconds on the deploy screen or, when deployed, with the map to get a feel for the geography, the current flag, and ways to get to it. Ordnance Expert: Arm or defuse a bomb in Frontlines. Once one of the teams is pushed back to their base, they must defend against enemies trying to arm explosives on a set of final objectives. Having reached this point, your Frontlines match may soon be over, so give it your all to arm bombs or defuse them before the timer reaches zero. The explosives will appear on different places on the map for each match and are marked on the map. Remember, the final objectives serve an additional purpose: if you’re defending them, they can be used to call in supportive fire against the enemy. To do this, just walk up to and interact with them. Keep Moving: Capture eight objectives in Frontlines. Compared with modes like Conquest, capturing an objective in Frontlines is rarely an easy affair – after all, you’re attempting the exact same thing as the opposing team. So, how do you do it? Just deploy and hope the enemies don’t know their arsenal from their elbows? While that helps, you’ll have a great edge by playing in a diverse, communicative squad that's greater than the sum of its parts. Think about it: if you can be covered, resupplied, and even brought back to life, the odds that you’ll secure the flag move in your favor. Lock and Load: Kill 15 enemies with a self-loading rifle. Here’s one for the sharpshooters. Deploy as Recon, equip a self-loading rifle such as the Model 8, ZH-29, and RSC, and score 15 kills with this weapon type. You can fire a lot more rounds with self-loading rifles compared with the bolt-action ones, but the trade-off is that you’ll also do less damage. Use the hold breath button to steady your aim and – unless you want to attempt something fancy – try to wait until an enemy is still before pulling the trigger. 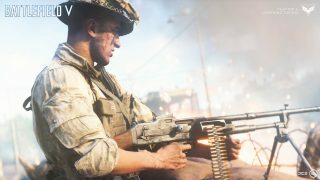 There are many handy tips on self-loading rifles at the Battlefield V Boot Camp – check them out! Full Auto: Kill 15 enemies with an MMG. MMGs – medium machine guns – have large magazines and are capable of doing serious damage, especially at a medium range from their target. This Support class weapon is heavy and requires a bipod, but once you’ve found a strategic place overlooking enemy-infested areas, you should be able to get your 15 kills soon enough. Want more tips? 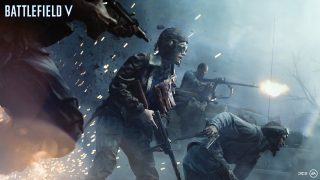 Become an MMG master at the Battlefield V Boot Camp. Gain Ground: Win a round of Frontlines. Perform focused attacks on contested flags, push the action all the way to the enemy HQ, and arm key points with explosives. Communication, skill, squad play, covering all angles, and good use of vehicles and Reinforcements will be your recipe for success. If you’re struggling, mix it up with classes and Combat Roles. If your squad is dying a lot, have another Medic or two be part of the squad, and make use of the gadgets. Though not the most glamorous way to win, you can also emerge victorious from a match if you’re leading when the time runs out. Dashing Death: Kill eight enemies while you are moving. Shooting while moving will hinder accuracy, but can be a valuable skill to learn – especially when outnumbered. Give this optional task a go in crowded areas, perhaps with a shotgun that can give you one-shot kills. Trust your instincts when it comes to aiming and you’ll get your eight kills soon enough – along with some Chapter XP. Frontal Assault: Capture three objectives in a round of Frontlines. Capturing objectives is what Frontlines is all about, and if your team is skilled enough to do it three times in one match, you’ll gain access to the final task of the Weekly Challenge. Occupy the objective areas with more soldiers present in the area than the enemy. Again, though it may be risky, standing close to a flag captures it faster. Spray and Pray: Kill 15 enemies with a submachine gun. Mostly associated with the Medic class, submachine guns (or SMGs) are designed for the up-close and personal combat typical for maps like Rotterdam and Devastation. To score 15 kills with these, utilize their high rate of fire in close quarters, since at range SMG damage falls off quite a bit. Get more great SMG tips at the Battlefield V Boot Camp. Do Your Part: Earn a score of 25,000 in Frontlines. Only one thing left to do: apply everything you’ve learned about Frontlines and earn a score of 25,000 playing the mode. Play the objective – capture control points, arm objectives, disarm bombs – and the points will come flooding in. Complete this and the M1922 for the Support class will be yours. This French belt-fed MMG starts out with a whopping 150 rounds, which can be upgraded to 250 rounds through Specializations. The fire rate is a little lower, making it a bit easier to control. Thirsty for more Chapter 2 challenge and reward info? Whet your whistle with our article on Chapter 2 progression.